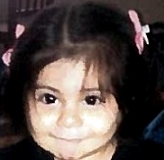 Keily and her brothers, Angel and Kevin, disappeared from Culver City, California on July 28, 2015. Authorities believe they were abducted by non-custodial adult male and female relatives. Few details are available in their cases.